DESCRIPTION;:Constructed as a joint effort of the British Admiralty, the Government of Canada and the Government of British Columbia, the Esquimalt graving Dock was completed in 1887. Ever since, it has served the needs of both naval and commercial vessels. 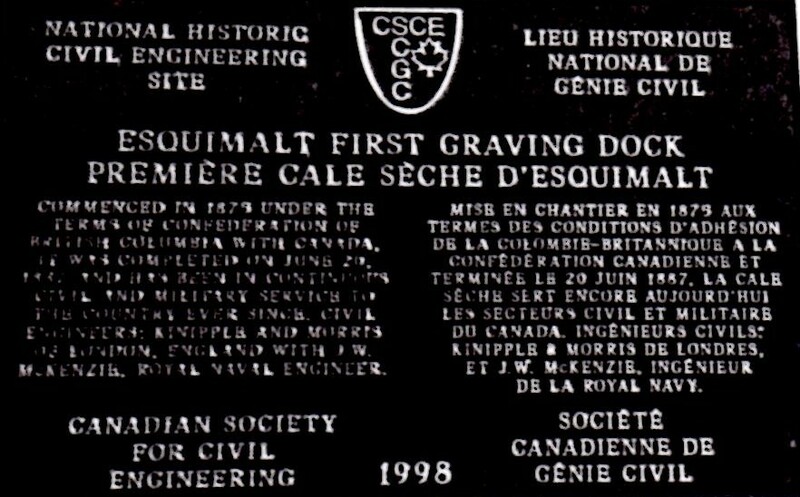 HISTORICAL SIGNIFICANCE: Formerly known as the “Esquimalt First Graving Dock”, the Naden Graving Dock is the oldest surviving dry dock on the Pacific Coast of the Americas. During the latter part of the 19th. century, the necessity for a dock on Vancouver Island, which had been long apparent to both the British Naval Commanders in the Pacific and the British Admiralty, became of even more importance. At that time the only dock in the Pacific to which the Royal Navy had access was the floating dock on Mare Island near San Francisco which had opened in 1854. A larger dock was opened in 1858, but these docks were in potentially enemy territory at a time when Anglo – American relations were charged with tension and a war seemed imminent. 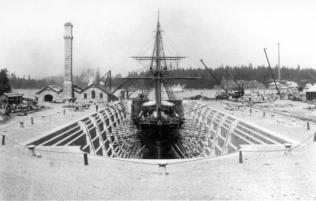 The site at Esquimalt was selected for construction of a dock. The first pile was driven in September 1876. Dock construction started in 1879 but stopped again in April 1882 due to lack of funds and the project was taken over by the Provincial Government.Work continued using day labour until August 1844 when the project was turned over to the Dominion Government. Work was eventually completed in on 20 June 1887.